Thank you for hosting us! Staff were incredibly friendly and helpful not only in person, but throughout the booking process as well. We love white pass village inn! 1003 needed a full-sized fridge and could have used some cooking essentials. We noticed and appreciated how some of the other condos have various cooking essentials like canola oil, salt & pepper, etc. which you wouldn't necessarily bring with you for a weekend. I love this resort. Its low key, affordable, gorgeous, family friendly and fun. Cant wait to go again. 122 is the best. The set up is perfect. So much storage. All went smoothly. Easy to book. Good service. Lots of choices. Excellent place to stay and ski. Great view. Efficiently organized. Well equipped. Nice bed. Could have used a small step ladder in unit to reach high shelves. Photos made it look much bigger than it actually was. We got used to it, however. The unit had lots and lots of hooks and the view of the Alpine area was great. Staff has been friendly from the moment I booked reservations over the phone until the time we checked out. Everyone we interacted with was extremely nice and responded right away to requests. We've stayed at your facility many times over the past three years and always enjoy it. The room appeared to be one of the larger studios which is key when staying with kiddos. There were several amenities we haven't seen in other rooms that were great (heated towel and boot racks! ), it was clean and comfortable. Having a bathtub was great, I know many of the rooms don't. I loved the window seat which has an awesome view of the slopes Downside: the coffee pot did not match the coffee maker so the liquid wouldn't drain down unless we held up the stopper, which we didn't realize until trying to use it and the filter overflowed making a huge mess. The couch itself was clean and comfy, but the pullout bed is so uncomfortable we would bring an air mattress if we stayed in this room again. There were chairs, but wish there was some kind of folding table, like a card table as there is absolutely no where to put food while eating. Usually the units have everything we need, but this unit was just missing a few items. Team was easy to work with and explained everything. Super!! I'll be back with my family next time. Only for small or cozy group though. At first I thought it too small then got used to it and it worked fine. Everyone was friendly and knowledgeable. It was a pleasure. The view of the Mountain from the room was an epic touch! I had a wonderful time staying at the White Pass Village Inn Rentals! I will definitely return! The room was spacious and met our needs nicely. And the hot tub pool! I will definitely be returning to stay again! Unit 122 does not have a ski locker. Blinds didn't work and certainly don't filter morning light. Bedroom area didn't have door or curtain for separation. Very nice quality and clean. Staff at the Check-in Desk was friendly. Why are the bathrooms so tiny? I would gladly lose space in the main room in exchange for enough room in the bathroom so I could sit strait on the toilet instead of 45 degrees off-center. Those bathrooms are too small for no good reason. Perhaps you should consider rotating the toilets slightly so they are not parallel to the walls which they are too close to. Over the years I have stayed in more than one room, and every time I would gladly trade just a little space in the main room in exchange for some elbow room in the bathroom. However, I still love to stay at White Pass Village Inn because of location and overall coziness. 140 Sleeping loft is just too cramped. Nowhere could I stand upright in the sleeping area. Next time I will return to a non-loft room like I have rented in the past. I would recommend this room to very short people only, unless they want to sleep on the sofa-bed. When we checked in she was incredibly happy and helpful. She was really quick and enthusiastic. She also recommended restaurants in Packwood where we had one of our best meals of our trip! All of it far surpassed my expectations! I felt so refreshed and blessed when we left. We loved the kitchen in #3 which was well stocked. The beds were super comfy! The views were amazing. Great management team working there. I love the area the trees, the mountains..perfect for an outdoor wedding. It's a super experience. The Village Inn is located where it's at! It has it all, lakes to fish, trails to hike, slopes to ski! It's a great place to stay whether you like the out of doors or stay in. Great, clean lodging! It was a wonderful place to meet our PCT hikers. It was convenient since it is so close to the trail. Having a full kitchen was very helpful since there are not really restaurants right here. The store next door did have pizza. The pool was relaxing too. John is super friendly and welcoming. White Pass Village Inn feels like home and is always wonderful. Good luck with the painting!! Thank you!!!! Super fun place. We will be back! Judi was very helpful to me. Bed was comfortable, Heater worked well. Shower worked well. Room did have a musty smell to it though. team was super friendly on the phone and in person. very helpful! 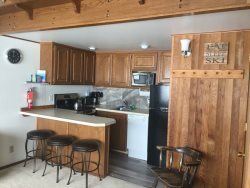 We loved our condo rental experience and the staff was amazing! We look forward to our next stay! Staying at your property was so great, wi-fi would be great but not a necessity. It was so great to be so close to White pass. The pool, being able walk to the mountain and sled outside your door, amazing!! My kids want to come back twice next year because they had such a great time. Thanks! It was a great vacation. Small but perfect for lodging during ski. Favorite features were Heated pool and full size kitchen appliances in the room. I would not recommend this size unit for two separate couples because the bathroom is cramped. Choose your layout carefully depending on party size. Although there are enough beds to accommodate the number of people suggested for each room it can be VERY cramped with that many people, especially with one bathroom. We love White Pass! While the rentals are small, the layed back atmosphere is great! We had a great time. Great location, its across from the ski lodge and next to the snow shoe Office. This year the snow blown path to the pool was way better. However I did fall down the snowy stairs out the double doors on the way to the pool. Friendly and very helpful staff. They made my husbands birthday perfect in every way! I wish every place I have stayed was this wonderful. Thank you for making our mini-vacation perfect.